Swiss Chard is one of those vegetables that is scheduled to show up in our CSA box every once in a while… and we replace it with something else. Not necessarily because we don’t like it, but we just don’t have a great “go-to” recipe for it. We may have found that recipe! 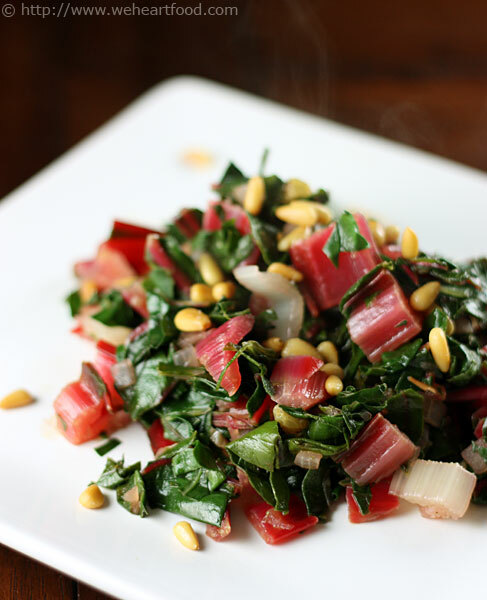 I like that unlike some other recipes, it uses both the stems and the leaves of the chard — it looks great when made with Rainbow chard. Here the chard is just steamed/sauteed with onion and golden raisins, and topped with salted browned pine nuts. Heavenly! Yum — I usually don’t like raisins in savory dishes, but they’re actually good in this. Hm, wonder if it’s because they soak up some of the steaming liquid and plump up… or because I chopped them smaller so you don’t notice them. Ha! I also like these salted pine nuts on top. Same here, though I like salted anything. The chard isn’t bitter at all; this is really good. The cooked onions also add more flavor. Yeah, it’s great. Don’t sub out the chard anymore! I don’t think you’ll have to worry about that! Toast nuts in oil in a wide 6- to 8-quart heavy pot over moderate heat, stirring constantly, until golden, 1 1/2 to 2 minutes, then transfer with a slotted spoon to paper towels to drain and season with salt. Cook onion in oil remaining in pot, stirring occasionally, 1 minute, then add chard stems and cook, stirring occasionally, 2 minutes. Add raisins and 1/2 cup water and simmer, covered, until stems are softened, about 3 minutes. Add chard leaves and simmer, partially covered, stirring occasionally, until leaves are tender, about 3 minutes. Don’t overcook or it’ll get too limp. Season with salt and pepper. This entry was posted on Tuesday, February 17th, 2009 at 6:33 pm	and is filed under Sides. You can follow any responses to this entry through the RSS 2.0 feed. You can leave a response, or trackback from your own site. I absolutely love swiss chard! Try steaming/sauteing it in a little water and bacon grease (i.e. the amount left over in the pan from cooking a couple strips of bacon) and then top it with crumbled bacon and salt and pepper to taste. It’s delicious and so easy! I absolutely love this combo! Will do it next time I get a hold of some chard!